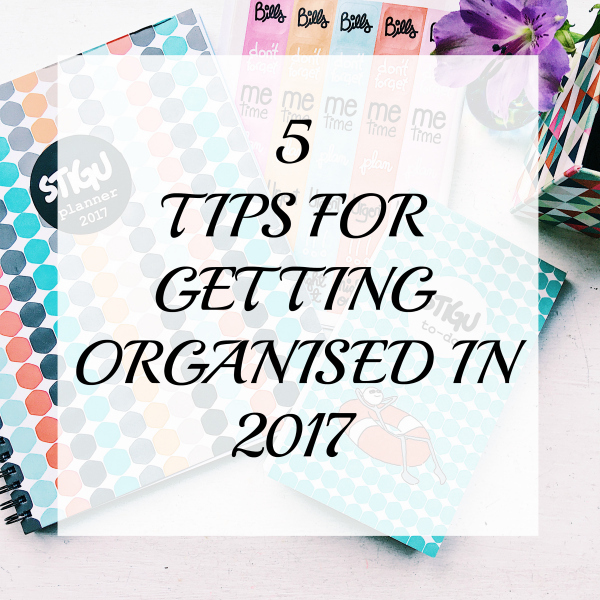 5 Ways to Get Organised in 2017 & WIN a Stick-to-stigu planner! You know what they say: Organisation is the key to productivity… or maybe they don’t say that and I’ve just made it up, but it doesn’t make it any less true. Being organised IS the only way to be productive, without organisation – especially for those of us that are busy parents – life seems to muddle into one thing or another. I’m currently feeling the lack of January organisation so I thought, for my benefit as much as for yours, I would write down my ways to get organised for 2017. Let’s make this OUR year. Clutter is the enemy of the mind… or something like that. Whateves, clutter is a bad thing. I find that when my desk has too many papers on it or my stuff is piled high I get a neurotic twitch in my eye that can only be considered similar to the one I get when my kids won’t go to bed. Unlike feral children, clutter is an issue that can be solved and I really do think that have a “nice” space, that isn’t drowning in overwhelming mess will make you a more productive worker. I’m talking about those moments when you decide that a task will take 30minutes without reeeeeally thinking it through. Give yourself plenty of time to do the things that NEED to be done. I am a bugger for this – guess what, that email I want to send really can wait until after I’ve picked the kids up, yet I will frequently rush my way through and end up blitzing my way towards the school like a bat out of hell. I work well under pressure but I can’t tell you how often I’ve read something back and not responded well because of rushing, had I put the school run first and then answered the email after, it would have been much better. 3. Plan stuff. No really. How far in advance do you plan? I’m currently working on Valentine’s day campaigns and I’ve already been approached about Mother’s Day and Easter. For my work I try to make sure I have a rough month plan and then I am planned one week in advance. 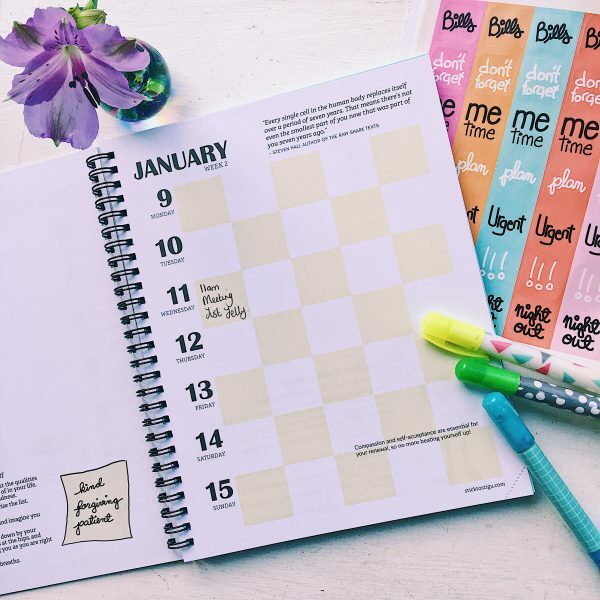 I might not be scheduled on the blog, but I’ve planned it in my planner – which brings me neatly to my next point BUY A GOOD PLANNER. Not one for this, one for that, one for confusing yourself and one for playing with because it’s pretty. 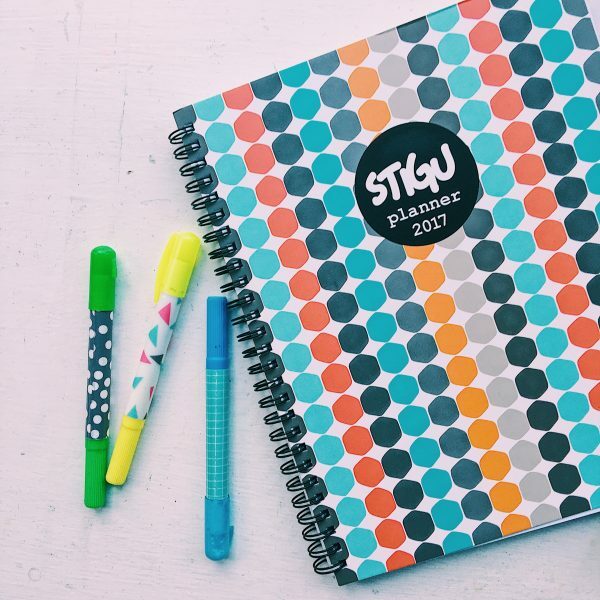 Buy a GOOD planner that you love and use it for everything. 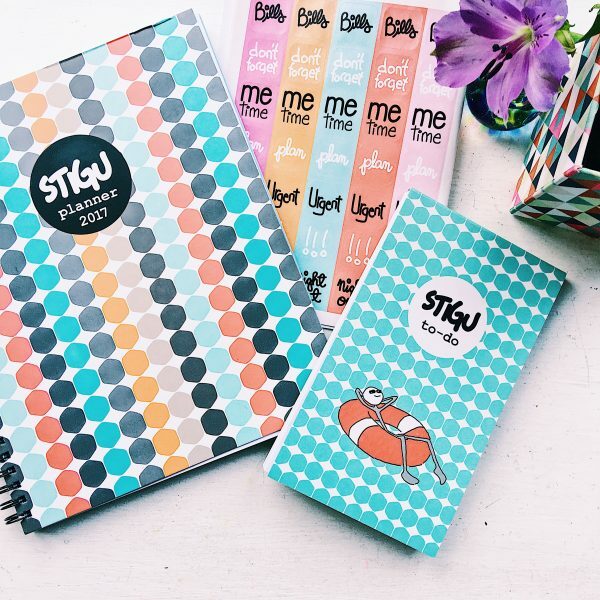 I have a daily diary for my personal life which I use to jot down family events and I will also include work based meetings etc but for work I have one planner by the very awesome Stick to Stigu for all elements of work. It allows me to write ideas and notes as I go along, plan a schedule and write down what I’ve charged for and when I’ve been paid. It’s imperative to have somewhere to write down what you are going to do. Just in case you can’t wait until my competition ends, I have a discount code for amazon RIGHT HERE with a fab 15% off, just enter TAR15OFF at the checkout on amazon! 4. Set goals, monthly AND annual. Even super man had kryptonite (can you tell I’m a boy mum?). Everyone has a limit – taking on so much that no amount of writing it down or organising yourself will be effective is never going to help you organise your life for 2017. Know your limits and stick to them. What are your tips for organisation? Next Post The books said she’d sleep by now. They lied. Start blogging on a regular basis. 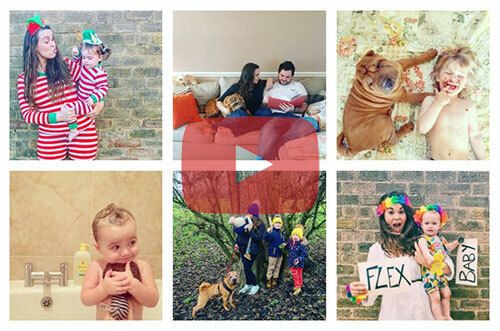 My goals are to be more organised and relaxed with my children and to have the most fun of all. My goals are to pass my driving test and loose 10lbs!! My goals for 2017 are to spend far less on things I don’t need, to save a set amount of my income every month and to de-clutter my life in many ways! My goals are to continue with my HNC Studies in Quantity Surveying which I will complete in 2018 as well as working hard at work learning the job as a trainee QS. I’dlike to just managed to be at least a little bit organised this year lol! This would certainly help! Good luck everyone! To lose weight and hopefully to start university! My goal is mainly to survive the year, because my dd is sitting her GCSEs this year, and gets so stressed about life! Great post, I have had a declutter which got the year off to a good start. Honestly, I would love to run a half marathon (maybe even a marathon), though even writing that down feels huge as I currently shuffle quite slowly having recently had a baby! To get healthier and fitter. To eat less junk food, in the vauge hope it helps me get my bmi down! eek! My goals for 2017 are to go clean organic foods only for me and my family, and also to try hard to save some money, even if it’s a small amount. I definitely need to get more organised. I buy so many planners and notebooks but don’t get any use out of them, oops! Great tips and im loving my Stigu! They have thought of everything havent they! Some good tips and love the planner such a good way. Ooh I entered the giveaway I would love to win. My goal for this year is to find a new job, find new ways to monetize content and pay off my debt. Having a planner would definitely help me to organize my life. I need all the help I can, I can just about remember what day it is currently! I would be lost without my planner. This one looks great! Setting goals monthly is something I need to start! I think that is such a great idea! I am trying to learn my limits at the moment and keep on top of all I have committed myself too. I tend to take on loads and get stressed which isn’t good. I think a planner might come in handy. A lovely post! I agree with all of these tips, maybe this is why I’m soo organised! My one main goal for 2017 is continue my blog schedule and stick to it for the whole year! To find a job, and organise my garden! My plan this year is to declutter the house and get organised. I hate mess but it seems to be a constant in my house at the moment. I have set social media targets for my blog but no real targets for myself. im hoping to stop smoking and have mroe fun in 2017!! To qualify as a Yoga Teacher!! To get a better paid job! I love planning also! I like to get organised by filling in my monthly view halfway through the previous month. Must get off sofa and organised! To graduate with a 1st is my ultimate goal of 2017! I absolutely love stationery like this! Great competition! In 2017 I’d love to be able to get myself into a proper routine! Being organised really makes a difference in my life, if I do not stay organised I suffer for it. It is very important to know your limits and not take on more than you can handle and writing out your goals/plans monthly and yearly is very helpful. It lets you look ahead and plan accordingly. Going back to work again. I’m desperate to get back out there again but my ex partner works all the hours of the day and it’s hard for me to find some hours around his and working and using childcare would cost me a fortune while he pays a very small amount to me that wouldn’t even pay for one days nursery for 1 child never mind after school care for the other. So my little boy is starting nursery soon and I hope to be back in work asap! Ooh I’ve been after one of these for ages but I’ve not been organised anough to actually order one ? This year I am definitely going to try and be more organised. I am making lists every day and it’s helping. One of my goals is to make a career out of blogging so I can stay at home and work around my children. Oh my gosh they are gorgeous and just what I need. I am quite possibly one of the least organised people ever! 2017 is the year I am determined to be more organised!